Jazz guitar icon Pat Metheny and his Unity Group and the adventurous classical vocal ensemble Seraphic Fire are among the celebrated musicians slated to perform on Lawrence University’s 2013-14 Performing Arts Series. Season subscriptions for both the Artist and Jazz Series or a “Favorite 4” package are now available, with discounts available to senior citizens and students. Single-concert tickets go on sale Sept. 18. For more information, contact the Lawrence Box Office, 920-832-6749. All concerts are held in the Lawrence Memorial Chapel. The St. Louis Brass Quintet, one of America’s oldest such ensembles, kicks off the four-concert Artist Series Oct. 11. Praised by the St. Louis Post-Dispatch for creating an “atmosphere that emanates from the stage,” the group has performed more than 2,500 engagements during its nearly 50-year history. The quintet includes founding member, St. Louis native and trombonist Melvyn Jernigan as well as top musicians from throughout the country. 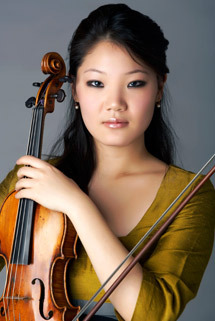 Internationally acclaimed violinist Rachel Lee performs Feb. 8, 2014. Lee has showcased her prodigious skill worldwide since performing at the United Nations at age nine. A Harvard University graduate, Lee is noted for her compelling stage presence and commitment to a wide-ranging repertoire. She has enjoyed solo engagements with the National Symphony, the Aspen Sinfonia at the Aspen Music Festival and repeat performances with the Seoul Philharmonic. Most recently she has made orchestral debuts with the Chicago, St. Louis, Houston and Seattle Symphony orchestras. A week after Weiss, the vocal ensemble Seraphic Fire, along with Spektral Quartet visits April 18, 2014. Featuring some of the country’s most talented vocalists, Seraphic Fire performs a diverse repertoire of choral works, ranging from Gregorian chant to newly commissioned works. The 11-member ensemble received two Grammy nominations in 2012 for their recordings of Brahms’ “A German Requiem,” which debuted at No. 7 on the Billboard Classical charts and a Christmas album that entered the top 10 on iTunes’ Classical chart on the day of its release. The Chicago-based, all-male Spektral Quartet blurs the lines between old and new music, pairing Beethoven and Mozart with Phillip Glass and Elliott Carter. Their innovative programs have become favorites of both classical music enthusiasts and new music aficionados. Lawrence’s 33rd annual Jazz Celebration Weekend opens the four-concert Jazz Series Nov. 8-9 with concerts by the Kate McGarry Quartet and the Yellowjackets, respectively. Named DownBeat Magazine’s “Rising Star Vocalist” five times (2007, ’08, ’09, ’11, ’12), the “astute and sensitive” McGarry also earned a 2009 Grammy Award nomination for best jazz vocalist. Drawing upon everything from her cultural Irish tunes to musical theatre to pop favorites, her discography includes five critically acclaimed albums, including “Girl Talk,” a tribute to her favorite jazz women vocalists, which was named one of the top jazz CDs of 2012 by Downbeat. The Yellowjackets, a smooth jazz and jazz fusion group, has been a jazz world mainstay since their formation in 1977. The four-member group, among the longest tenured groups in jazz history, has effortlessly evolved with the times, earning two Grammy Awards along the way. From their first self-titled album in 1981 through 2011’s 11-track CD “Timeline,” the Yellowjackets’ discography numbers 25 releases. 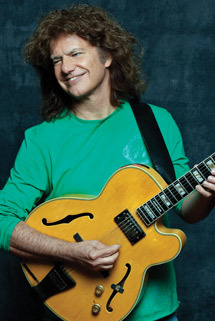 On March 15, 2014, Lawrence welcomes Pat Metheny and his Unity Group. Winner of an astonishing 20 Grammy Awards in 12 different categories, Metheny’s musicianship is legendary. A nonpareil guitarist as well as accomplished composer, his impressive body of work includes compositions for solo guitar, small ensembles, electric and acoustic instruments, large orchestras and even ballet pieces. Metheny previously performed at Lawrence in 1984. He’ll be joined on stage by his powerhouse Unity Group that features four all-star musicians in their own right: saxophonist Chris Potter, drummer Antonio Sanchez, bassist Ben Williams and pianist Giulio Carmassi. 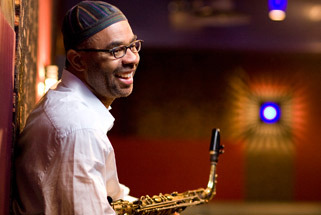 The Kenny Garrett Quintet closes the jazz series May 2, 2014. In a stellar career spanning more than three decades, Garrett has established himself as the pre-eminent alto saxophonists of his generation. After launching his career with the Duke Ellington Orchestra, he has gone on to perform with many of the giants of the genre, including Art Blakey, Chick Corea, Miles Davis, Joe Henderson, Herbie Hancock, among others. The latest of his 19 albums as leader, 2012’s all-original “Seeds from the Underground,” earned two Grammy Award nominations. Garrett’s work often incorporates world music influences as reflected in his 2006, multi-award nominated disc “Beyond the Wall,” which interweaves his interests in Asian music with jazz. This will be Garrett’s second appearance on the Lawrence Jazz Series, having previously performed in Feb. 2000. 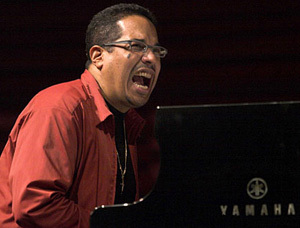 Grammy Award-winning pianist and composer Danilo Pérez joins the Lawrence faculty jazz trio Friday, May 11 at 8 p.m. in the Lawrence Memorial Chapel for the final concert of the 2011-2012 Jazz Series. Tickets, at $22-20 for adults, $19-17 for seniors, and $17-15 for students, are available through the Lawrence Box Office in the Music-Drama Center, or by calling 920-832-6749. The Panama-born Pérez began playing piano at age three as a student of his father, Danilo Sr., and later studied classical music at the National Conservatory in Panama. After moving to the United States, he completed a degree in jazz composition at Boston’s renowned Berklee College of Music. While at Berklee, Pérez began performing with jazz heavyweights Jon Hendricks, Terence Blanchard, Claudio Roditi and Paquito D’Rivera. In the late 1980s, Pérez became the youngest member of Dizzy Gillespie’s United Nations Orchestra. Today, in addition to his own trio, Pérez also performs as part of the Grammy Award-winning Wayne Shorter Quartet. “Danilo’s music has the capacity to connect your soul with the unique sonorities of the universe in perfect harmony. It is just beautiful,” said José Encarnacion, instructor of jazz and improvisational music and jazz performance coordinator at Lawrence. Encarnacion, a saxophonist, along with Dane Richeson, percussion and Mark Urness, bass will join Perez on stage as the Lawrence Faculty Trio. Based in Boston, Pérez serves as artistic director of the Panama Jazz Festival, artistic advisor of the innovative Mellon Jazz Up Close series at Philadelphia’s Kimmel Center and artistic director of the Berklee Global Jazz Institute. Three-time Tony Award nominee Kelli O’Hara and a dynamic doubleheader weekend of award-winning jazz vocalist Kurt Elling and the renowned Maria Schneider Orchestra are among the celebrated performers on the 2012-13 Lawrence University Performing Artist and Jazz Series. Subscriptions for both series are on sale now and subscribers may choose from the Artist, Jazz, or “Favorite 4” concert packages, with discounts available to senior citizens and students. Single-concert tickets go on sale Sept. 17, 2012. Contact the Lawrence University Box Office at 920-832-6749 or visit the Lawrence Performing Arts page for more information. After starring runs in the Tony Award-winning revival of “South Pacific,” “The Pajama Game” and “The Light in the Piazza,” O’Hara has established herself as one of Broadway’s great leading ladies. Hailed as Broadway’s “golden girl” by the New York Times, O’Hara brings her soulful soprano voice to the Lawrence Memorial Chapel March 9, 2013 as part of the four-concert Lawrence Artist Series. Cellist Matt Haimovitz and pianist Christopher O’Riley open the Artist Series Oct. 27 in an eclectic collaboration that crisscrosses classical and pop music genres, showcasing their talents as collaborators and soloists. Their program will feature works by Bach and Gabrielli, Radiohead and Arcade Fire, Piazzolla and Stravinsky. A pair of April 2013 concerts rounds out the Artist Series schedule. The Jupiter String Quartet, winners of both the Banff International String Quartet Competition and the Fischoff National Chamber Music Competition, performs April 12, 2013 while the Berlin Philharmonic Wind Quintet, hailed as “arguably the best ensemble of its kind in the world” by the Manchester Evening News, takes the Memorial Chapel stage April 26, 2013. 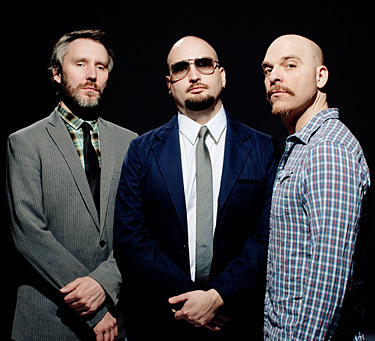 Formed in 2001, Boston-based Jupiter added winners of the Young Concert Artists International auditions to its resume in 2005. One of America’ most dynamic young string quartets, Jupiter performed the entire cycle of Beethoven string quartets — all 16 — last summer for the Aspen Music Festival. 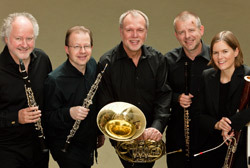 The Berlin Philharmonic Wind Quintet — the first permanently established wind quintet in the Berlin Philharmonic’s long history of chamber music — has been dazzling audiences around the world since 1988 with an uncanny ability to unite five disparate sounds into a collective smoothness. Redefining the sound of the classic wind quintet, the ensemble’s repertoire includes the full spectrum of the wind quintet literature as well as works for enlarged ensemble, among them the sextets of Janácek and Reinicke or the septets of Hindemith and Koechlin. The Kurt Elling Quartet and the Maria Schneider Orchestra headline the Lawrence’s 32nd annual Jazz Celebration Weekend Nov. 2-3, respectively. Elling, described as “the standout male vocalist of our time”‘ by the New York Times, performs with the Lawrence Jazz Ensemble. A nine-time Grammy Award nominee and 2009 Grammy winner for “Dedicated To You: Kurt Elling Sings The Music Of Coltrane And Hartman,” Elling has won the DownBeat Critics Poll Male Vocalist of the Year Award an astonishing 12 years (2000-2011) in a row. This will be Elling’s second appearance at Jazz Weekend, having previously performed in 2003. An internationally renowned jazz composer and conductor, Schneider formed her 17-member orchestra in 1993. A weekly performer at Visiones in Greenwich Village early on, the orchestra has since become a staple at concert venues around the world, earning 2005’s “Large Jazz Ensemble of the Year”‘ award from the Jazz Journalists Association. Her orchestra’s albums “Concert in the Garden” and 2007’s “Sky Blue” earned Grammy Awards and were named “Jazz Album of the Year” by the Jazz Journalists Association and the Downbeat Critics Poll. Vocalist Gretchen Parlato closes the four-concert Jazz Series May 10, 2013. A Los Angeles native, Parlato won the 2003 Thelonious Monk International Jazz Vocals Competition and two years later released her debut self-titled album to critical acclaim. Following the release of her second CD, 2011’s “The Lost and Found,” Parlato was named No. 1 Rising Star Female Vocalist in DownBeat Magazine’s Annual Critics Poll. Two-time Grammy Award-winner Christian McBride and his acoustic jazz quintet Inside Straight performs Friday, May 14 at 8 p.m. in the Lawrence Memorial Chapel in the final concert of Lawrence University’s 2009-2010 Jazz Series. Tickets, at $20-22 for adults, $17-19 for seniors and $15-17 for students, are available through the Lawrence Box Office, 920-832-6749. Hailed as “perhaps the most exciting jazz bass player since Ray Brown” by All About Jazz, McBride has appeared on more than 250 albums, including five of his own releases. Playing both acoustic and electric bass, McBride has accompanied scores of jazz luminaries, among them Chick Corea, Herbie Hancock and Diana Krall. Over the past two decades, McBride has been one of the most requested sidemen in the music business, touring with such renowned jazz musicians and their bands as Roy Hargrove and Pat Metheney. Assistant Professor of Music Mark Urness, who teaches bass in the Lawrence conservatory of music, said McBride has been at the forefront of jazz bass playing for nearly two decades. Named “Hot Jazz Artist” of 1992 by Rolling Stone magazine, McBride won Grammy Awards in 2009 and 2006 in the best jazz instrumental album, individual or group category. He was named co-director of The Jazz Museum in Harlem in 2005 and recently finished a four-year appointment as creative chair for jazz for the Los Angeles Philharmonic. As a composer, McBride created “Bluesin’ in Alphabet City,” a commissioned work performed by Wynton Marsalis and the Lincoln Center Jazz Orchestra. Inside Straight features Eric Scott Reed on piano, Steve Wilson on saxophone, Warren Wolf, Jr. on vibraphone and Carl Allen on drums. APPLETON, WIS. — An eclectic mix of renowned performers and rising stars, including the multi-talented Bobby McFerrin and pianist Simone Dinnerstein, bring their musical virtuosity to Appleton for the eight concert 2009-10 Lawrence University Artist and Jazz Series. New York’s internationally acclaimed African-American quintet Imani Winds opens the Artist Series season Oct. 17. The Paris-based Ebène String Quartet, known for its careful attention to dynamic detail, comes to the Lawrence Memorial Chapel Feb. 5. Acclaimed operatic tenor Anthony Dean Griffey performs with renowned pianist Warren Jones April 9. Dinnerstein, “a phenomenon in the world of classical music” according to the Washington Post, closes the series April 30. Audience favorite Steve March Tormé opens the Jazz Series Nov. 6, kicking off Lawrence’s annual Jazz Celebration Weekend with the Lawrence Faculty Jazz. The Wisconsin Homegrown Jazz Quintet performs the second half of Jazz Celebration Weekend Nov. 7. McFerrin brings his inimitable style to the stage Feb. 19 in a performance with the Lawrence University Jazz Ensemble. Bassist extraordinaire Christian McBride and his band Inside Straight closes the Jazz Series May 14. Season subscriptions to either the artist, jazz or a “favorite 4” series that allows subscribers to select any combination of four concerts from either series, are currently on sale, with discounts available to senior citizens and students. Single-concert tickets go on sale Sept. 16. Contact the Lawrence Box Office at 920-832-6749. Since its 1997 founding, the Grammy-nominated Imani Winds has carved out a distinct presence in the classical music world with its dynamic playing, culturally poignant programming and genre-blurring collaborations. With two member composers and a deep commitment to commissioning new work, the group is enriching the traditional wind quintet repertoire while bridging American, African, European and Latin American traditions. The Ebène String Quartet — four young musicians from France all still in their 20s — has quickly become one of Europe’s most talked-about ensembles. The group made its American debut earlier this year in an eight-city concert tour to rave reviews. The New Yorker called their playing “so secure, alive, rich-toned, and profoundly musical that age ceased to be an issue.” The quartet is distinguished by its versatility, displaying equal facility in the classical repertoire and contemporary music. The Wisconsin Homegrown Jazz Quintet features five world-class instrumentalists all with state roots, including two with ties to Lawrence: bassist Ike Sturm, son of Lawrence’s director of jazz studies and improvisational music Fred Sturm, and drummer Zach Harmon, son of renowned composer John Harmon, the first director of Lawrence’s jazz studies program. The group’s members have worked with many jazz luminaries, among them Chick Corea, Herbie Hancock and Joshua Redman. McFerrin, winner of 10 Grammy awards and creator of the iconic pop classic “Don’t Worry, Be Happy,” makes his fourth appearance at Lawrence in a performance of “Migrations” with the LU Jazz Ensemble. The work, which McFerrin commissioned Fred Sturm to write, is a “musical plea for world unity” that showcases 23 indigenous songs from 21 countries. In the work, McFerrin improvises and interprets Sturm’s scores of an aboriginal chant from Australia, a Mbuti Pygmy tribal song of the Democratic Republic of the Congo and an Inuit chant from Greenland, among others. Despite not yet turning 40 years of age, McBride has been among the most omnipresent figures in the jazz world for 20 years. Bassist, composer, arranger and educator, McBride’s career collaborations read like a Who’s Who of music’s most dynamic artists, including Sonny Rollins, James Brown, R&B superstars Isaac Hayes and Natalie Cole, pop icons Sting and Don Henley, hip-hop’s Queen Latifah, opera legend Kathleen Battle and bass virtuoso Edgar Meyer. The quintet “Christian McBride & Inside Straight” is scheduled to release its first CD, “Kind of Brown,” this June.